In other words, it’s a simple matrix calculation: the exact kind of thing you might want to optimize with Rcpp. For fun, I decided to implement this same computation in Rcpp code, specifically using the RcppEigen package, since having matrix classes is really nice in this case. ##  "names for target but not for current"
Notice that RcppEigen does not set the names of these vectors in the same way that diag does, so the vectors are not precisely identical. 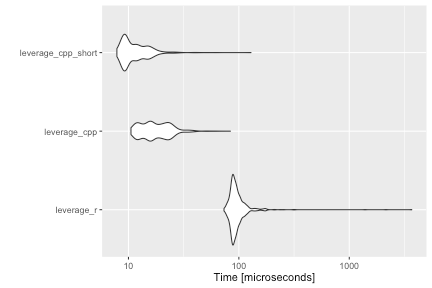 As expected, the Rcpp code is 5 to 10 times faster, even on this small data set. But there’s a small mystery here as well: why is the second piece of C++ code faster than the first? If you’re operating in R world, it’s not all that surprising that two different pieces of code to do the same thing have different performance characteristics. This is, after all, the main reason that the microbenchmark package comes in handy. But since C++ is a compiled language, I generally expect the compiler to figure out that two pieces of code that do the same thing ought to boil down to the same machine code. Why is that not the case here? The answer is probably to do with how Eigen (the library that RcppEigen wraps) defers computation of an expression in intelligent ways. My guess is that Eigen figures out at compile time that there’s a really simple loop for computing this matrix expression, and pares your high-level description down to a simple statement. By breaking the computation in to two parts (as in the first C++ function), you hamper the ability of the library (not the compiler!) to help you out. This whole experience has made me much more cautious about the C++ code that I write for R, to the point that I’m now prone to writing the function a number of different ways, and then doing some tests with microbenchmark to see what ends up being faster. Of course, it’s arguable that I should have been taking that kind of empirical approach to begin with. If anyone can shed some light on this by looking at the assembly output (which is beyond my own abilities), I would be quite grateful.